This little pdf clocks in at 5 pages, 1 page SRD, leaving us with 4 pages of content, full of feats…so let’s take a look! -All-Around Melee: Share Improved Uncanny Dodge with adjacent allies. Ouch! -Bloody Advantage: Flat foots opponents suffering from bleed for all subsequent attacks you execute this round. A bit opaque; could be read as needing to cause this bleed and since it seems to indicate that you have to hit foes before they’re FF versus follow-up attacks; the trigger could be clearer. -Clear-Headed Advantage: Same as Bloody Advantage, but for dazed, staggered and confused foes. Same wording complaint. -Critical Sneak Attack: Add +2 damage per sneak die when criting with a sneak attack. Solid. -Ethereal Weakness: Incorporeal creatures are no longer immune to sneak attack. Gets magic/non-magic right. Nice one! -Explosive Smoke: Add +1d6 fire damage on initial impact of smoke bomb, +1d6 for every 4 (not 4th!) levels after that. Ref-save for half damage in splash radius. -Free-Moving Advantage: Same as Bloody Advantage, but for entangled or grappled foes. Same wording complaint. -From the Darkness: +1atk and damage when striking from areas of darkness. Filler. -Gooey Weakness: Elementals, oozes and proteans may be affected by sneak attack. Nice. -Height Advantage: Same as Bloody Advantage, but for prone foes. Same wording complaint. -Inject Poison: Increased poison DC when used in conjunction with sneak attack. -Invigorating Advantage: Same as Bloody Advantage, but for fatigued and exhausted foes. Same wording complaint. -Magical Trickery: Gain ghost sound, mage hand, prestidigitation and spark as an SP “ability total of nine times per day.” Wording is nonstandard, but you get what it means. -Magical Trickery, Improved: Gain charm person, disguise self, illusion of calm, sleep and vanish as an SP “ability total of six times per day.” Wording is slightly nonstandard, but you get what it means. Also: Very powerful and has an excess “and” in the spell enumeration. -Magical Trickery, Greater: Gain ghost accelerate poison, darkness, darkvision, detect thoughts, invisibility, knock and minor image as an SP “ability total of three times per day.” Wording is nonstandard, but you get what it means. Again, very powerful. -Magical Trickery, Superior: Gain ghost blacklight, deep slumber, gaseous form, penumbral disguise, major image and seek thoughts as an SP “ability total of three times per day.” Wording is nonstandard, but you get what it means. Again, very powerful. -Mirror Strike: +10 to ninja or rogue level to determine whether you can flank foes with improved uncanny dodge. Neat one! -Poisoned Advantage: Same as Bloody Advantage, but for foes suffering from a poison. Same wording complaint. -Sickening Advantage: Same as Bloody Advantage, but for sickened and nauseated foes. Same wording complaint. -Slowed Advantage: Same as Bloody Advantage, but for foes suffering from any penalty to Dex, Dex damage or drain. Same wording complaint. -Smoke Pouch: Throw 2 smoke bombs sans needing ki, +1 free at 6th level and every 3 levels thereafter. -Sneaky Combat Maneuver: get +2 to executing a combat maneuver, +1 for each sneak attack die you possess in excess of 2d6. -Starhand: Use shuriken as a melee weapon. -Stylish Ki: URGH. Makes ki behave as grit. Not even remotely balanced. -Trick Variety: First time you use a ninja trick each day, it costs 1 ki less. See, this is VERY powerful…but it emphasizes variety and thus can be considered to be neat. -Unexpected Advantage: Target is flat-footed against each AoO you make after the first. Editing and formatting are very good on a formal level, good on a rules-level. Layout adheres to a no-fills two-column standard and is relatively printer-friendly. The pdf has no artwork or bookmarks, but doesn’t necessarily need them at this length. 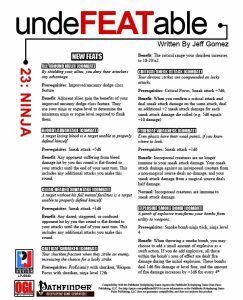 Jeff Gomez’ ninja feats are…well, less amazing than I would have wished for. The Advantage feats universally suffer from a wording that could easily be a tad more precise, but at least you get what they’re supposed to mean. I do not think shuriken builds need even more damage, so those feats will get nowhere near my game. Similarly, the balance of quite a few feats here is off: Making ki like grit is broken; a feat granting an exclusive ability of a PrC is not cool and the SP-array is similarly a blatant escalation of the spellcasting the class already can get. From a diversity point of view, the pdf sports a ton of the advantage feats and I don’t like even one of them; the precision-damage unlocks are nice and so are the smoke bomb tricks, but as a whole, I don’t really see myself returning to this pdf. Combined with the balance-concerns I have, this makes it impossible for me to recommend this pdf, in spite of its low asking price. My final verdict will clock in at 2.5 stars, rounded down for the purpose of this platform.